AMMAN — Jordan's industrial exports to Syria dropped by 70 per cent in the first quarter of 2019, despite the resumption of normal flow over the land border crossing between the two countries, President of the Jordan Chamber of Industry (JCI) Fathi Jaghbir said on Monday. Jaghbir told the Jordan News Agency, Petra, that the Kingdom’s industrial exports to Syria declined to JD19 million during the January-March period of the year, compared with JD61 million during the same period of 2018. He attributed the drop to obstacles and procedures imposed by the Syrian authorities on Jordanian exports, requiring the Syrian importer to receive an importation licence that allows importing certain quantities and goods from the Kingdom. In addition, Jaghbir said, Syria has a list of a wide variety of commodities that are banned from entering the country under the pretext of protecting local items. The Jaber/Nasib crossing between Jordan and Syria was back to business as usual on October 15, after it was reopened for passenger and cargo movement under certain conditions agreed upon between the two countries. Jaghbir, who is also president of the Amman Chamber of Industry, called on the government to adopt the principle of reciprocity with Damascus, which he claims is hindering the entry of Jordanian products to its markets through imposing “illogical” conditions and constraints that completely contradict the Kingdom’s mechanism in dealing with Syrian products entering the local market, according to Petra. He also highlighted the importance of imposing constraints on Jordanian imports from Syria and any other country that imposes conditions on the Kingdom’s exports to their countries. “There is a dire need to implement swift procedures that can protect Jordanian products, in particular, and the national economy, in general,” the president stressed. Jaghbir noted that since the beginning of the conflict in Syria in 2011 until 2018, Jordanian exports to Syria or national products transiting through the northern neighbour dropped by more than JD150 million. In this regard, he added that the relative importance of the Syrian market to the national exports dropped from 3.8 per cent in 2011 to 0.7 per cent in 2018. The president called for continuing the implementation of procedures that aim at supporting national industries through administrative measures that counter such practices, especially since national industries are of high quality and contribute to the envisioned social and economic sustainable development. Produce exporters also voiced concerns last month over the lack of benefits from the reopening of the border crossing, noting that no trucks laden with commercial quantities of Jordanian fruits and vegetables have entered Syria since the resumption of land trade between the two countries. President of the Jordan Exporters and Producers Society for Fruits and Vegetables Zuhair Jweihan told The Jordan Times in previous remarks that there are no demands at all by Syrian traders and there are “other obstacles” that Jordanian produce exporters face when trying to export to Syria, he said, adding that these obstacles and the current conditions are negatively affecting Jordanian farmers and exporters alike. Currently, no Syrian fruit and vegetables are allowed entry into Jordanian markets, Jweihan said, but Syrian trucks enter Jordan and transport their agricultural produce to other countries via Jordan, he added, raising concern that Syrian produce would compete with Jordanian products in neighbouring countries in the summer. 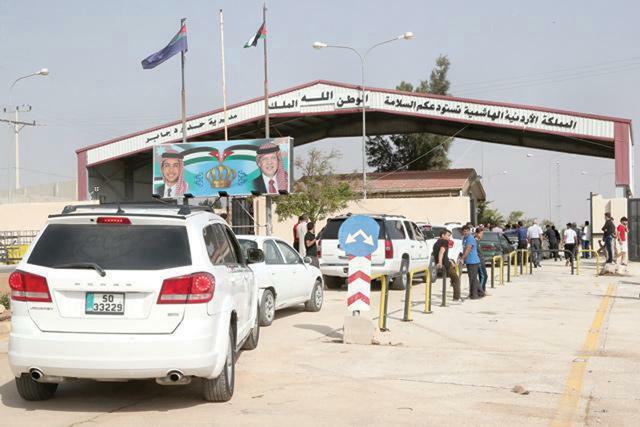 In April 2015, Jordan closed the Jaber border crossing with Syria for security reasons. Passenger and cargo traffic was halted as a result of the escalating violence in the Syrian town of Nasib, just across the border, some 80km north of Amman. Prior to the conflict in the northern neighbour, Jordan’s produce exports to Syria exceeded 200,000 tonnes per year, according to Jweihan, while Jordan also exported more than 60,000 tonnes of produce to Russia, eastern European countries and Turkey via Syria before.